Yesterday morning I sat down with my notebook and my pen and began to write a blog post. With the ever-present sounds of large consruction equipment tearing up the pasture behind my house, I began to pen my thoughts about how for the past eight years I was fortunate enough to live on 2 acres smack dab in the middle of bustling suburbia and yet I was insulated from it by this huge stretch of land behind my house. For eight years and many more before we moved here, that pasture was home to cows and an array of ducks and other water fowl who had found their way to the water tank used to keep the cattle watered as they grazed. I wrote as I wondered how often I have taken for granted this peaceful view, how many times I didn’t take advantage of the opportunity to sit on the back patio with a cup of coffee or glass of iced tea and simply enjoy the scenery and appreciate that it was there. Sometimes you really don’t know a good thing until it’s gone, especially those things you assume will always be there. 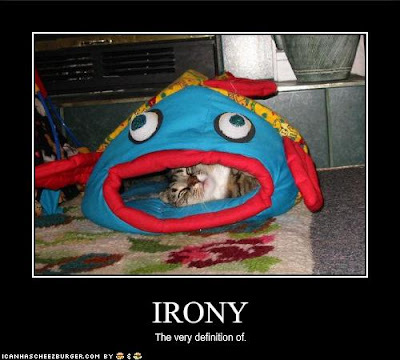 But back to the point of this post–irony. Typically when I write something out in longhand, I’ll type it out sometime during the day, let it sit for a little while and then edit and post it here in the evening. I prefer to schedule my posts to publish at the same time every day–12:01 a.m. That didn’t happen today.